Bullies Trying to Force Them Out Of Sports! And You May Not Even Know It…. From: Lisa Cohn and Patrick Cohn, Ph.D.
We had no idea we were opening up such a can of worms when we began talking to parents, coaches, and bullying experts about how bullying causes kids to lose confidence and in many cases quit sports. Your heartfelt, sometimes angry, often frustrated letters poured in, revealing painful stories about how your sports kids have lost confidence and been hurt by bullies who tease, taunt, intimidate, socially isolate and threaten sports kids. And the bullies, you’ve told us, aren’t only kids. In some cases, they’re coaches and even jealous sports parents! Kids are quitting sports because of the harassment and intimidation from bullies and coaches! When kids no longer enjoy sports, they drop out. Today, we offer a solution to help you take action and stop the madness! We reveal how to teach your kids to focus and perform their best when bullies strike. We need you to help us stage a revolution aimed at removing the power bullies have over your kids, a phenomenon that’s rampant in sports today, among both girls and boys. Who Are We, And Why Should You Listen to Us? We’re a brother-sister team, an award-winning parenting writer and a leading sports psychology expert. We are co-owners of the Ultimate Sports Parent and the Kids’ Sports Psychology online mental training web site. 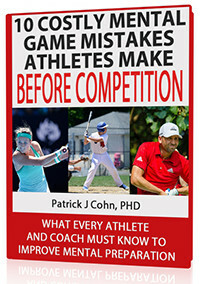 Dr. Patrick Cohn is a dedicated mental game coach, sports psychology expert and sports parent. He has studied, researched, and worked with thousands of athletes for nearly two decades. He has worked with some of the top athletes in the world–including PGA tour winners and NASCAR winners–on techniques to improve confidence, focus, and composure in sports. He has interviewed many top athletes in the world, including Thurman Thomas, Michelle Akers, Ernie Els, Mario Andretti, and Helen Alfredsson to uncover the strategies, techniques and skills that keep these professional athletes at the pinnacle of performance. Dr. Cohn has authored and produced an extensive library of sports psychology books, videos, audio programs and training seminars. (Visit the Peaksports.com mental training proshop or sports psychology seminar page for details). He has a Ph.D. in education from the University of Virginia. Lisa Cohn is an award-winning parenting writer and book author whose stories have appeared in Mothering, the Christian Science Monitor, Parenting and other publications. She’s been quoted about parenting by the New York Times, Associated Press and Time Magazine. Lisa is a mom and step mom to five young athletes and a former youth sports coach. She’s the host of the popular podcast series, “Ultimate Sports Parent Radio,” which has more than 65,000 subscribers. Lisa played three sports as a student at Wesleyan University, Middletown, Ct.
As sports parents, we’ve both seen how prevalent and destructive bullying is in sports. All kinds of sports kids can be the targets of bullies…. Gifted athletes are often targeted because others are jealous. Kids who are smaller and less physically advanced also can become the focus of bullies. When kids are competing for a ladder position on a team, bullying is also common. Girls taunt, tease, exclude, and hurt one another in sports just as much as boys do. What’s more, bullies aren’t just sports kids. There are lots of bully coaches out there, too, who do a lot of damage. We’ve seen many of them first hand. They yell at, intimidate, harass, and threaten their young athletes—often in the name of winning. When sports kids become the target of bullies—whether the aggressors are athletes or coaches–they often lose confidence and in many cases self-esteem. And this affects their performance, too. They play tentatively, worry constantly about what others think of them, and live in fear. This hurts both their performance and enjoyment of sports. Ultimately, some kids can’t cope and they simply drop out of sports altogether. We’ve also learned sports kids don’t tell their parents what’s going on. That’s why sports parents and coaches must be more aware and understand why bullies behave the way they do, how to stop them, and how to ensure sports kids stay mentally tough when bullies strike. How much bullies hurt sports kids’ performance and enjoyment in sports. How to start the revolution by telling parents and coaches how they can protect sports kids and put an end to bullying. How to avoid making comparisons when bullies point out weaknesses. Protect Your Kids From Bullying Today! We are on a mission to help sports parents, coaches, and young athletes learn strategies to deal more confidently with bullies. Our new program is really two programs in one. One part of the program helps parents and coaches teach kids to cope with bullying, and the other part teaches young athletes–ages 8 to 16–how to stay confident, focused and composed in the face of bullies so they can stay in sports and enjoy sports more. Help Your Kids Enjoy Sports More! A comprehensive e-book for parents and coaches researched by Lisa Cohn, an award-winning parenting writer. The e-book, based on interviews with bullying experts, sports parents and coaches and our own sports psychology programs, gives a roadmap for stopping bullying: what parents should do, what coaches should do and how adults can help kids can stay confident and mentally tough by using our proven sports psychology strategies. We include a series of audio interviews with bullying experts and coaches that explains why sports kids and coaches bully, how it affects young athletes, how girls in sports are different than boys in the way they bully, and how sports parents and coaches can take action and help their kids. Download the audio mp3 files immediately. Interview with Carl Pickhardt Ph.D., a seasoned psychologist and author of “Why Good Kids Act Cruel,” who explains why kids bully and gives concrete tips for dealing with them. Interview with Mark Hamilton, a professor of philosophy who teaches college courses in sports ethics at Ashland University and a former college player and a coach, youth sports coach, and sports parent who explains why kids don’t talk about being bullied and why they often drop out of sports. He tells how to start the revolution against bullying. An interview with C. Roger Rees, a professor in the Department of Health Studies, Physical Education and Human Performance Science at Adelphi University who gives statistics about the bullying epidemic and describes how commonplace “hazing” is in sports. An interview with Timothy A. Dimoff, a youth coach and founder and president of Sacs Consulting & Investigative Services, Inc. And he is an expert on violent behavior and author of the book, “Life Rage,” who explains why bullying is more commonplace now, why coaches bully and how to deal with them. An interview with Paul Coughlin, a sports dad, coach and anti-bullying expert whose son dropped out of sports in response to bullying—but learned the secret to warding off bullies and returned a few years later. An interview with popular youth sports coach Doug Donaldson, president of PlaySportsTV, who explains how he deals with aggression, intimidation and harassment on his teams. “Appreciate You Talents: How To Avoid Making Comparisons” eBook. Athletes who are victims of bullies fall into the trap of comparing themselves to other athletes. In our new program we teach athletes how to stop making comparisons to other athletes. This sports psychology e-book, written for kids, helps young athletes avoid making comparisons that hurt their confidence. It teaches them to focus on their own positive qualities. Adolescent and Child Psychiatrist Dr. Anandhi Narasimhan, who has a private practice in Los Angeles, explains why bullying is bad for kids and why parents and coaches need to take action. Andi McCormack, Founder of Penny Lane Dance Academy in Los Angeles, who has performed around the world, explains why dancers bully and why coaches/teachers are responsible for putting an end to this behavior and ensure kids stay composed and confident. VALUE of all Bonuses Alone = $180.00! Today, you can get our new program for our low price of $97. Let us recap what’s included… Get our new program, the 34-page guide for sports parents, the 35-page workbook for sports kids, and nine special bonuses for an low price of $97. Are you a member of Kids’ Sports Psychology? Members get this program for free and discounts on many other mental game programs for sports kids and parents. What’s more, you can download our new program immediately after purchase. You’ll have no shipping and handling fees! Try Our Program — We’ll Take All the Risk! We’ll assume all the risk to make this purchase easy for you. We are so confident that you and your kids will benefit from our new program that we offer a 100% satisfaction guarantee. All we ask is that you read, use, and apply the strategies in this new program completely. If you don’t like our new program–for any reason at all–email or call us for a full refund within 30 days of your purchase date. And you keep the free bonuses! No questions asked. Fair enough? When you click “Order Now” below, you’ll be taken to an order page where you can order your program. You just need to have a valid credit or debit card handy for your order. Thank you for reading about helping young athletes stay confident and mentally tough when bullies strike. Please contact us if you have any questions or comments. P.S. Let’s ensure your kids stay in sports. Give your kids the tools to be confident, focused and composed when intimidated and harassed by athletes and coaches. Order today. Get it FREE for Kids’ Sports Psychology Members.